There are thrilling connections between stories; themes of morality, the afterlife, guilt, what we would do differently if we could see into the future or correct the mistakes of the past. 'Afterlife' is about a man who died of colon cancer and keeps reliving the same life, repeating his mistakes over and over again. Several stories feature characters at the end of life, revisiting their crimes and misdemeanours. Other stories address what happens when someone discovers that he has supernatural powers—the columnist who kills people by writing their obituaries in 'Obits'; the old judge in 'The Dune' who, as a boy, canoed to a deserted island and saw names written in the sand, the names of people who then died in freak accidents. In 'Morality,' King looks at how a marriage and two lives fall apart after the wife and husband enter into what seems, at first, a devil’s pact they can win. 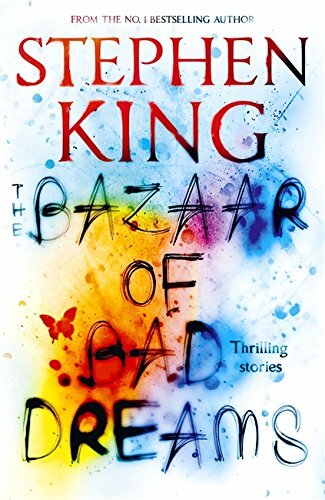 Magnificent, eerie, utterly compelling, these stories comprise one of King’s finest gifts to his constant reader. "I made them especially for you," says King. "Feel free to examine them, but please be careful. The best of them have teeth." 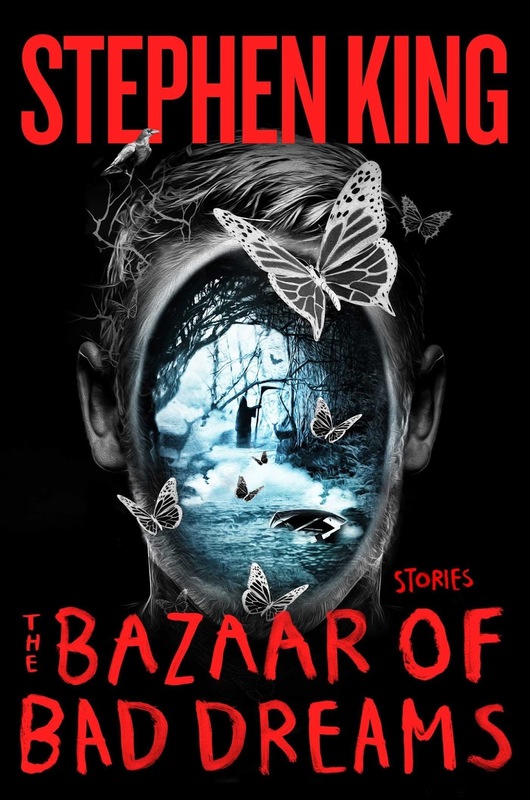 "I never feel the limitations of my talent so keenly as I do when writing short fiction," confesses Stephen King in the introduction to The Bazaar of Bad Dreams: an unusually introspective yet no less effective collection of eighteen variously terrifying tales, plus a few pieces of poetry, from the affable author of last year's similarly reflective Revival. This is far from the first time King has discussed his "struggle to bridge the gap between a great idea and the realisation of that idea's potential," and although, as readers, we only have the end product to parse, the ideas the Edgar Award winner explores here—and the characters, and the narratives—are not at all inadequate. 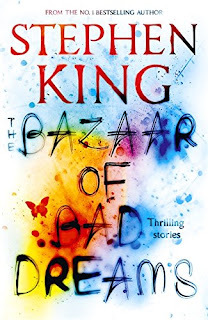 If anything, in dispensing with the hallmarks of Halloweeny horror to which his bibliography is so bound in order to investigate a goody bag of markedly more grounded goings-on, the stories brought together in The Bazaar of Bad Dreams number among King's most thoughtful and evocative. Which isn't to say they ain't scary. They absolutely are! 'Premium Harmony,' 'Batman and Robin Have an Altercation' and 'Herman Wouk is Still Alive,' for instance, are still seething somewhere under this critic's skin, but said tales are scary in a more mundane way than you might imagine. Respectively, they address the mindless last fight between a man and his wife, the hellish senselessness of senility and suicide as a means of finally achieving freedom. Death is depicted in countless other, equally ordinary ways over the course of The Bazaar of Bad Dreams: as a name sketched in the sand in 'The Dune,' an unpleasant smell in 'Under the Weather' and an increasingly meek mutt in 'Summer Thunder.' King hasn't suddenly come over all subtle, but this collection clearly chronicles a gentler, more contemplative author than the purveyor of penny dreadfuls whose part he has played with such panache in the past. To his credit, King is not above throwing the odd bone to that segment of his readership who come to his collections expecting something speculative. There may be precious few proper monsters in The Bazaar of Bad Dreams, but 'Bad Little Kid' documents a sort of haunting, 'Ur' is straight-up science fiction and 'Obits' is about a journalist who wields his words like a deadly weapon. That said, there's more to even those stories with what we'll call unlikely leanings. 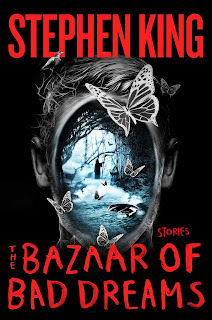 That's as may be, but there's quite a bit of confessional—and fascinating—non-fiction in The Bazaar of Bad Dreams to boot. In addition to the aforementioned introduction and an Author's Note in which King admits his work will never be finished, not until he "either retires or dies," (p.v) appended to each of the subsequent shorts—some of which, such as 'Mile 81' and 'Blockade Billy,' aren't very short at all—are pages of pointed preamble reminiscent of On Writing.